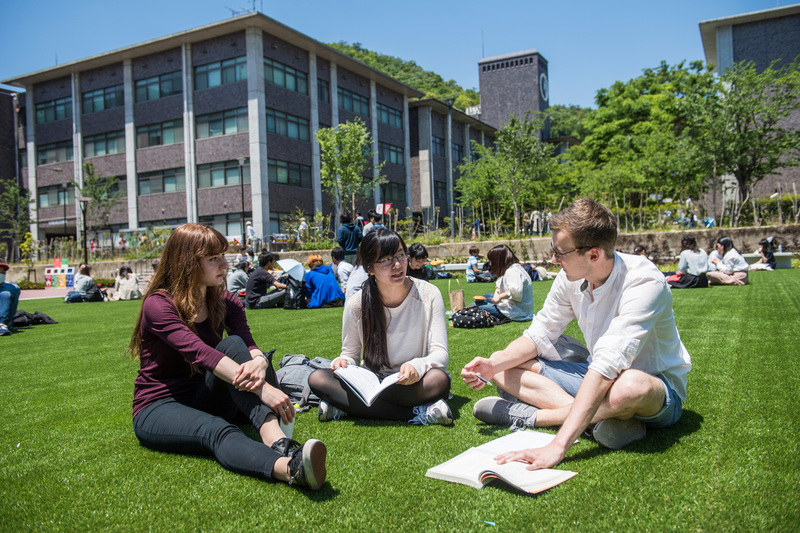 Why choose English-medium Undergraduate programs at Ritsumeikan University? English-based Undergraduate Programs enable access to the variety of academic courses for students who are not good enough at Japanese language. After enrollment, International students will have opportunities to learn Japanese in/outside of the curriculum. Student diversity is one of the most attractive features of RU. In 2017, 1890 degree-seeking international students from 61 countries studied in our graduate and undergraduate programs. RU always gives you a lot of chances to meet students from areas with very different culture. Student diversity makes your university life exciting and contributes to your fruitful academic activities in Japan. Ritsumeikan University has four campuses in the Kansai region. English-medium undergraduate degree programs are offered at three of these campuses. Global Studies Major is based at Kinugasa Campus in northwest Kyoto City. Community and Regional Policy Studies Major is based at Osaka Ibaraki Campus which opened in 2015 in Ibaraki City, Osaka Prefecture. Information Systems Science and Engineering Course, a brand new program from 2017, is based at the Biwako - Kusatsu Campus in Kusatsu City, Shiga Prefecture. The three cities are within easy reach of each other. From Kyoto to Ibaraki (Osaka) and to Kusatsu (Shiga) takes just 20 to 30 minutes by train. Ritsumeikan University has study abroad agreements with more than 130 universities in 30 countries and regions. Students are encouraged to participate in study abroad programs or fieldworks overseas depending on their majors and academic fields. In addition, RU operates the Dual Undergraduate Degree Program (DUDP), in which students can earn bachelor’s degrees from both RU and allied universities. RU offers many programs such as off-campus voluntary activities, internships, on-campus peer support activities and various kinds of clubs and circles run by the students. International students with a student Visa can apply for tuition reduction scholarships. Accommodation in a furnished apartment or off campus dormitory is available for students of English-medium undergraduate programs providing the students with a good environment to concentrate on their study and day-to-day communication with other students. Below is information about the tuition reduction scheme for 2017 admissions. The tuition reduction is offered initially for one year, based on students’ admission evaluation. In second and subsequent years, the tuition reduction is awarded based on students’ grades during the previous year of study. Ritsumeikan University was selected by the Japanese government as one of the universities for the “Top Global University Project” in 2014. Selected universities are required to actively promote globalization among Japanese universities. Founded in 1900, Ritsumeikan boasts a history of over 110 years. RU is an integrated university with 14 colleges and 21 graduate schools. 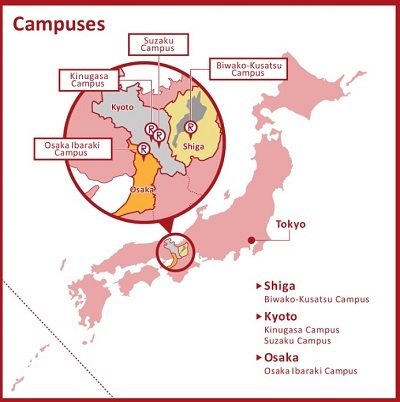 We have 4 Campuses in Kyoto City, Kyoto Prefecture, Kusatsu City, Shiga Prefecture, and Ibaraki City Osaka Prefecture. RU has a worldwide alumni network with 24 overseas branches. 1890 degree-seeking international students from 61 countries, Plus 180 non-degree international students from 27 countries in 2017AY. RU was ranked No.1 for the most foreign faculty members in a Japanese university in 2016AY. RU has a global network of 435 partner institutions worldwide. We also have study abroad agreements with 137 universities in 30 countries and regions. 99+% of international students in the English-medium undergraduate programs who applied for scholarships received financial aid in 2016AY. More than 95% of international graduates successfully got jobs in 2014AY. RU was ranked No.3 in QS Graduate Employability Rankings 2015(Pilot) among Japanese private universities. RU has 450+ student clubs and circles of all kinds, including sports, arts, Japanese culture and everything in between. RU was ranked No.1 in commissioned research by private-sector industries nationwide in 2015FY.